Sharp has cut the screen production for the full size iPad screen in its Kameyama plant to the minimal levels needed to keep the conveyor belts running, Reuters sources have indicated. This has been allegedly based on Apple forecasting weaker demand, as more and more people are shifting to buy the cheaper iPad mini with the smaller, less resolute screen. Officials from Sharp and Apple didn't reply to the report with comments, and Macquarie Research analsyts have estimated iPad shipments to fall nearly 40 percent to about 8 million, but the overall Apple tablet number to break a record thanks to the added boost from the iPad mini. This is why I doubt that Apple will release a retina iPad mini with A6 processor at $329 this spring. Who is going to pony up $500 for the 9.7" when the mini is more popular? A retina mini could even hurt their iPhone business. Ludicrous!!! People don't want small, cheap tablets! I know this for a fact, some guy said so one time. Sorry Apple but you have just sinned, you should have upheld Steve Jobs' commandment: "you shall not make a smaller iPad". Add A6X, seriously revamped IOS 7, 1600x 1100 screen on the iPad mini and you got one great device. 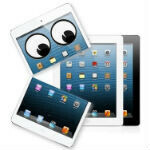 So what if it kills the large iPad, if Apple sells it in record numbers? And then they're saying "iPad mini's not cannibalizing iPad sales, it's making another market."